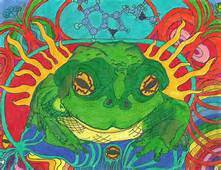 known as "the toad of the dawn" or "the Sapo DMT". determents your disconnection of your true self. referred to the drug as the "God molecule" or the "spirit molecule"
can go into a state of unconsciousness or a drug induced coma. planet at any level: physical, emotional, mental and spiritual. limited by space and time. our mind, our true nature, oneness and unconditional love. dangers of bufoteina and DMT are suppressed.